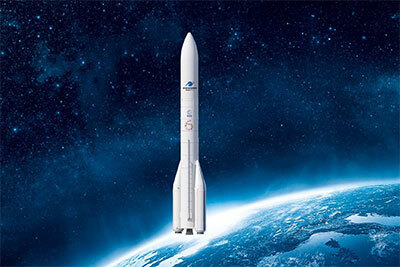 Arianespace will launch four new satellites for the Galileo constellation, using two Ariane 62 versions of the next-generation Ariane 6 rocket from the Guiana Space Center in French Guiana. The contract will be conducted by the European Space Agency (ESA) on behalf of the European Commission (DG Growth) and the European Union. Stéphane Israël, Arianespace Chief Executive Officer, and Paul Verhoef, Director of Navigation at the European Space Agency (ESA), signed the launch contract for four new satellites to join the European satellite navigation system Galileo. The contract will be conducted by ESA on behalf of the European Commission (DG Growth). These launches are planned between the end of 2020 and mid-2021, using two Ariane 62 launchers – the configuration of Europe’s new-generation launch vehicle that is best suited for the targeted orbit. The contract also provides for the possibility of using the Soyuz launch vehicle from the Guiana Space Center, if needed. Both missions will carry a pair of Galileo spacecraft to continue the constellation deployment for Europe’s satellite-based navigation system. The satellites, each weighing approximately 750 kg., will be placed in medium earth orbit (MEO) at an altitude of 23,222 kilometers and be part of the Galileo satellite navigation constellation. Galileo is the first joint infrastructure financed by the European Union, which also will be the owner. The Galileo system incorporates innovative technologies developed in Europe for the greater benefit of citizens worldwide. A total of 18 Galileo satellites already are in orbit. Fourteen of these satellites were launched two at a time by Soyuz launchers, with the last four orbited on a single Ariane 5 ES mission in November 2016. Two more Ariane 5 ES missions are planned on December 12, 2017 and in the summer of 2018.